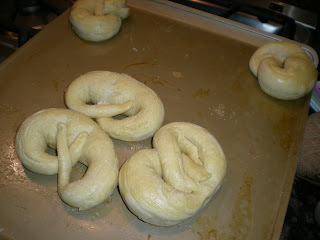 For a fun multi-age, interdisciplinary Lenten activity, we made Lenten pretzels. We learned the religious history of the pretzel, made our own homemade pretzels (recipe and pictures below), and did a little Lenten reading to make a well-rounded activity. "Pretzels were made in the fifth century as a Lenten food in Austria, Germany, and Poland. People began to make them on Ash Wednesday to prepare for the very first day of Lent. During this time, the faithful kept a very strict fast all through Lent: no milk, no butter, no cheese, no eggs, no cream and no meat. They made small breads of water, flour, and salt to keep with the fasting and abstinence laws. To remind them that Lent was a time of prayer, they shaped these breads in the form of crossed arms since in those days they crossed their arms over their chest while praying. Therefore, they called the breads "little arms" (bracellae). From this Latin word, the Germanic people coined the term "pretzel." Thus, the pretzel can be an important food symbol in Lent. It still shows the form of arms crossed in prayer, reminding us that Lent is a time of prayer. It consists mainly of water and flour, therefore proclaiming Lent as a time of fasting and penance." Let yeast and sugar dissolve in water for one hour. Add flour to yeast mixture and beat until smooth. Knead mixture for seven to eight minutes. Place in a greased, covered bowl and let the dough rise until double in size. 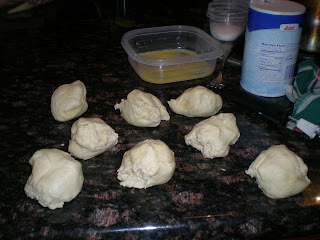 Divide the dough in half; then divide each half in to smaller pieces of equal size. Roll each piece in your hands to make pencil shapes twelve (12) to fifteen (15) inches long. Dear God, we ask you to bless these pretzels, which remind us that Lent is a sacred season of penance and prayer. Each time we eat a pretzel, may we be reminded that this is the season of Lent, a time of prayer. Help us to remember to pray for those who need our prayers each day. Keep your loving arms around us, O God, to protect us. We ask this in Jesus' name. Amen. They look yummy!!! We may have to try this! I thought about doing this before Lent started, but your post reminded me of it! I think we'll do it during Holy Week!